All these stainless steel cutters by Birkmann in Germany are beautifully detailed so little to no decorating is needed! Use with our No Fail Sugar Cookie Recipe below. 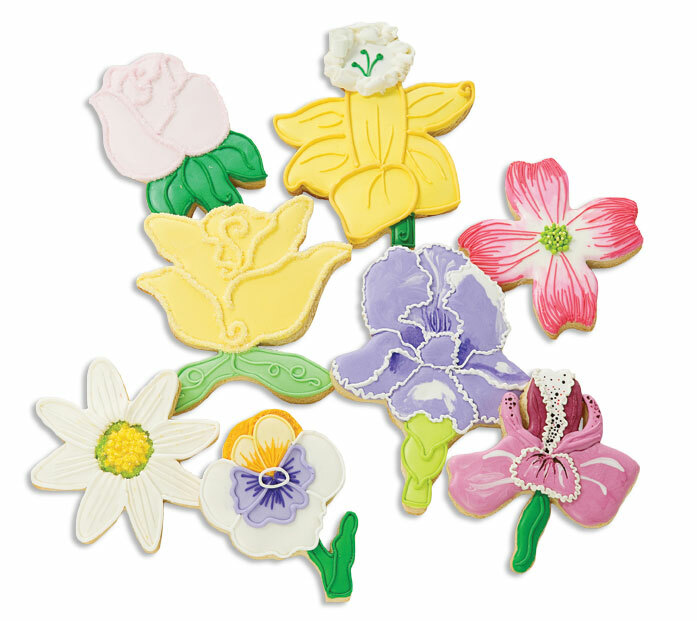 Also read on for great Royal Icing decorating tips! This set of 3 bird, tulip and butterfly cookie cutters are cleverly designed to hang on a coffee, tea or cocoa mug! Very cute for a spring or summer tea party! Use these cutters with our No Fail Sugar Cookie Recipe for great results! Fancy Tip: We recommend using our Royal Icing Mix, a pre-mixed bag of meringue powder and confectioners (powdered) sugar) you just add water! The mix will ice approx. 24 large (3″-5″) cookies depending on the detail of icing. After initially mixing with water, divide your icing into small measuring cups with spouts. You will need one for each color that you want to decorate with. Add desired food coloring. Beat in additional water with spatula a little at a time, until your icing is a consistency somewhere between heavy cream and ketchup. Now you are ready to pour your icing into squeeze bottles. Pastry bags work fine too, but the squeeze bottles make life so much easier and they are great for kids to use! You will need a squeeze bottle for every color you are working with. Once icing is in bottle, invert bottle upside down inside of a tall drinking glass. In order to keep the tip from drying out, tear a little piece of paper towel, moisten it with water and place in bottom of glass. This will help with a clean, steady flow of icing out of the bottle. Step 1: Outline outside edge of cookie (this could be the whole cookie, or perhaps just certain parts depending on the look you are going for). Step 3: Apply a separate color of icing onto the wet flood for a wet-on-wet technique. Some fun ideas to try are: polka dots, stripes, and swirls. * Wet detail on dry flood. This creates a 3D effect and is perfect for adding faces and other details. * Toothpicks! Use toothpicks when you are doing a wet-on-wet technique. Draw toothpick through stripes to create a feathered or tie-dye look. Draw through a dot to make a heart or clover. Make a swirl and then draw lines though from the center outward to make a web. Truly, the possibilities are endless! * Apply decorative sugars, quins, dragees and edible glitter to wet icing at any time for a great WOW factor. * After your cookies are decorated let them completely dry for at least 24 hours, uncovered. The cookies will not dry out, because the royal icing holds in the moisture. Once completely dry you can stack, store, ship, and if you haven’t done it already, eat! There are many other fun techniques to try. Don’t be afraid to try something new. If you don’t like it, you can always just eat the evidence! Let the cookie be your canvas and have fun decorating! This entry was posted in All Things Baking, Baking Inspiration, Cookie Recipes & Ideas, Halloween Baking, Instructions & How-To's, Recipes & Tips, Spring Baking, Summer Fun Baking and tagged cookie cutters, decorating tips, decorating tools, royal icing, sugar cookie recipe by Fancy Flours. Bookmark the permalink.